"Thank you so much for a great tour last night. You were charming, delightful and very informative and we all thoroughly enjoyed ourselves despite the rain. Everyone was still chatting about it this morning." "I just wanted to say a big 'thank you' to you and your other three guides for looking after our team yesterday. Everyone really enjoyed the Windsor castle tour. You and your team’s enthusiasm truly shone through. Many thanks for making the visit so enjoyable!!!" "We had a wonderful time at Windsor Castle and everyone was amazed and impressed. Thank you so much for organising everything and making our journey around the castle so interesting. Your knowledge of the Queen and Castle made the tour extra special. Thank you so much. I will have pleasure in reviewing you on TripAdvisor and will give you a 5* review." "Amanda was wonderful, a joy to be with, we would recommend her highly." "Thank you for organising another wonderful visit to Windsor for our pupils and their German friends. They returned full of excitement at having been so close to the Queen! For our German friends it was a perfect example of a quintessentially British occasion with Union Jacks, bunting and patient crowds!" "I want to say a huge thank you and your lovely guides for the walk. Despite the cold it was absolutely fabulous, I thoroughly enjoyed it and know that the groups really had a good time. Please pass on my thanks to the other guides and thank them for being so passionate about what they do, for making it so enjoyable and for coming out on a freezing cold night. And of course a massive thank you for helping organise a memorable experience for our international guests. Well done everyone." "My husband and I would like to thank you for the wonderful tour. We have learnt so much British history and traditional customs from you." "I just wanted to thank you and your guides. Our group enjoyed our tour with these very knowledgeable and lovely ladies." "Our guide was not only extremely informative but has a lovely bubbly personality and it was a pleasure to spend our tour of Windsor Castle with her." "Amanda was enthusiastic, informative and great fun." "I would recommend anyone whether organising a group or personal experience to try Windsor Tourist Guides Ltd, you will have a great time." "Professional, knowledgeable, friendly, fun and patient. Amanda has been an absolute superstar with the groups I have operated in Windsor." "You were absolutely lovely, and quite the loved guide by your peers." "What can I say? Thank you! The journalists were very happy with the tour, they said you did a great job of ensuring everyone was involved and the children especially were engaged. Thank you so much!" "My guests thought Amanda was superb and I would recommend her to anyone who is looking for an insightful and fun tour of Windsor." "Just wanted to convey our group's appreciation of your very informative tour and the way you did this in stages made absorbing the information very pleasurable and entertaining." "I just wanted to say thank you again for being such a fantastic tour guide for my group. They thoroughly enjoyed their tour of Windsor Castle and definitely will be looking to do it again next year." "We had our best walking tour ever and we have had many in our time." "The interaction with Amanda's business has been first class." "The tour was very good and enjoyed by all the guests. Amanda worked closely with me to organise the time and collected the guests from the hotel, took them through security [Windsor Castle] and delivered them back to the hotel. Windsor Tourist Guides provided a very good service." "We had a wonderful time with Amanda. We all agreed she was worth every penny we paid. She was so interesting and we loved missing the queues!" "I have been hearing that the weekend was a great success and in no small part I understand to your wonderful tours with what one guest highlighted as very personal and bespoke information. You are indeed a wonderful asset." "A quick note to say that our team thoroughly enjoyed the tour. I also wanted to say thanks too for helping me organise everything at relatively short notice. Everybody had a good time." "On behalf of the 63 people that you and your guides conducted around Windsor Castle may I say a big thank you. They all thoroughly enjoyed the tour and the pleasant and knowledgeable way that you carried it out. Thanks again, all three of you helped to make our weekend." "On behalf of my guests I would like to thank you for a superb tour. They all thoroughly enjoyed it, and it added that extra special part to their UK trip. 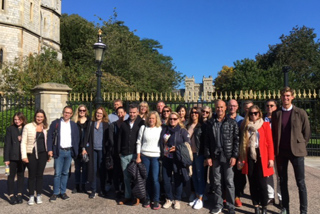 Even our UK guests were pleasantly surprised with all that they learnt, even those who have frequently visited Windsor." "Thank you so much for the tour, everyone was more than happy, which means we are... so thank you." "Just wanted to say thank you for organising our guide on Tuesday, she was great! Really interesting and we all had a good laugh." "We had a very enjoyable day out Windsor. Our guide was wonderful and enthusiastic and made our experience unforgettable. We would all like to thank her for sharing her expansive knowledge with us." "Thank you for making our visit to Windsor town castle so memorable last weekend. We are so grateful to you and Windsor Tourist Guides for delivering a fantastic experience. We had arranged a special outing for our friends who were over from France and visiting England for the very first time. You arranged everything with clockwork precision, from the coffee break in the High Street where we had a grandstand view of the changing of the guard, through to the easy entrance to the Castle, tour of the St. George's chapel and the state apartments. Your recommendation at the end of the tour on a place to eat in town was a really perfect end to the day. All our group, 14 people in total, with ages ranging from 4 years old to 76 years old, said how knowledgeable you were and attentive to their various questions and needs. We would not hesitate to recommend Windsor Tourist Guides to anyone who wanted to get the very best out of a visit to Windsor." "Once again on behalf of our whole group I just wanted to thank you heartily for such a fantastic tour which you provided to us last week. Your knowledge and enthusiasm were conveyed so warmly and with such interest that everyone thoroughly enjoyed the visit and it was made so memorable for all of us. Thank you also for the lengths you went to in ensuring that our [ill] colleague was looked after – you really went above and beyond and we were all really grateful to you for all your help and kindness." "Thank you so much Amanda for such an interesting and fun ghost tour, we all enjoyed it very much. We were all quite nervous going up to the loo!" "From the people I spoke to last night they really enjoyed the tour, as they are only here for 3 days and don't have much time to get out, your tour was perfect!" "Hi Amanda, this is just a short note from me and the team to say a massive thank you for your brilliant walk of Windsor on Wednesday night. We found the whole evening a brilliant tour of history, facts & fun, and with your own personal touch, you made it a very special evening for us all. Put simply, we think you were fabulous." "Just a quick note to say thank you very much for organising the tour of Windsor so perfectly. Everyone who managed to make it to Windsor was hugely impressed with the town & castle, but particularly with the knowledge of our guide, who managed to answer any questions, and made the visit much more interesting for all of them - please can you pass on my thanks?" "I just wanted to send a mail to thank you and Amanda for the truly excellent tour you gave us. Everyone was impressed by your knowledge and especially your enthusiasm. Even though the weather was against us you both made the sun shine!" "Please can you pass on our thanks to our guide, a wonderful character, full of bounce and enthusiasm and really knew how to get the group interested and involved during the walk, not that they needed much prompting! She has to be one of the most knowledgeable guides on Windsor and of the Royal family I have ever met!! I will definitely be recommending Windsor Tourist Guides to friends and work colleagues for when they have the occasion to either visit the Windsor area or holding a meeting." "I've had such good feedback from everyone, they all enjoyed it immensely. It was a pleasure liaising with you and should another event arise I will certainly keep you in mind." "We enjoyed the tour very much and I want to send a special thanks for both guides who took very good care of us and made the end of our conference perfect! Thank you so much!! I have heard a lot of good words about the tour from our customers. Many thanks also for having been so kind to help me plan this tour and also giving me good recommendations for restaurants etc. I couldn´t have been happier with my choice!" "We had a great time at Windsor Castle and the rest of our day was lovely too. We even had the sunshine which was an added bonus! Thank you very much everyone was really pleased with the tour round the castle in particular our President. If we ever plan anymore trips for which we need a tour guide I will definitely be in touch. In the meantime I would highly recommend your tour guides to anyone!" "Thank you for another great guided tour! Our guide was amazing just like you said and was full of so much knowledge and interesting facts – our group really enjoyed the day. Please pass on our thanks – look forward to organising another day trip with you in the future!" "Just to say thank-you again for a wonderful day at Windsor Castle, we thoroughly enjoyed it and couldn't have asked for a better service than that which you provided! What is more, the Castle staff were so helpful and having a wheelchair along meant that we saw some very interesting "below stairs" aspects of the Castle which would otherwise have been hidden from us..."
"I have heard nothing but glowing reports about the tour! Thank you so much for all your help and assistance – it is really appreciated. Overall, we had a great conference – one to remember!" "Our day went well and added to the excellent Friday and Sunday the weekend was a big success. This was in no small way down to the brilliant tour you gave us around Windsor and Eton. We all agreed you brought the towns to life and added to the castle visit immensely with your commentary. Thanks." "Thank you for such an enjoyable guided tour around Windsor Castle yesterday. It was enjoyed and appreciated by us all. You made it informative and your pleasant manner added greatly to our visit." "Everyone was full of praise for their interesting tour of the Castle with you. Thank you very much. Should the opportunity arise we will not hesitate to recommend you to our friends. Many thanks for looking after everyone and making the tour so interesting." I have heard nothing but glowing reports about the tour! Thank you so much for all your help and assistance – it is really appreciated. Overall, we had a great conference – one to remember!